No microwave cookery for me, save baked potatoes. Thermidor is a pretty pricy brand of kitchen appliances. Their cheapest microwave oven is 800-bucks. They max out at $1,799. That might put them in the realm of commercial usage. I do not think any of our usual retailers (Wally-Market.....?) handles the brand. Our old G.E., a big one from 1978, continued working faithfully and trouble-free until we sold out of the Missouri Ozarks via an auction, and let it go. Can't begin to remember how many Thanksgiving turkeys that machine did! I got it in 1981, from a new co-worker who had moved his family to Phoenix from Wisconsin. He asked me if I would trade a decent handgun for his G.E. He wanted $300 equivalent, I happened to have a Ruger .357 revolver, the trade went down, and we were both happy! I think she was referring to the recipes in that cookbook. You won't find any of the high end appliances (Thermador, Sub Zero, Wolf, Viking, etc.) at your typical appliance dealer. Certainly not Wally World! I prefer my meat to have flavor from browning and the resultant fond from the process. That means, I would have to add that step prior to using a microwave or crock pot. I understand that crock pots these days have an insert that can be used on a stove top for this purpose. How would you do this in a microwave with out having to do stove top browning? If I have to use a separate pot to do the browning, I might as well finish the dish on the stove top or oven using the same pot. You can do the same with a pressure cooker. The Instant Pot doesn't brown as well as a stovetop pressure cooker or a pan, but still does a decent job. The Instant Pot is very fast and very convenient, which is why sales have exploded. Microwaves are convenient for some things, but pressure cookers are much better suited for many other things. Did I say they are also very fast? Oh, and you can use the saute function on the Instant Pot before going into slow cook mode if you want to brown the ingredients first. We have a pressure cooker that we use for things like red beans. I much prefer our enameled CI for braises, gumbos and stews. Not interested in "fast", I like the results of longer cooking. The oven brand was Thermador? Just asked my wife, who sold micros in the mid-'80s. She described Thermadors as top of the line, high quality, but does not remember stocking any. The name might by then have been gone. Down-swinging door: suggests perhaps Sharp copied the idea. May even have bought out Thermador, just conjecturing. I found a photo on the web. This is exactly what we used to have. Top and bottom were both conventional ovens with microwave mode on the top oven. Rear vent vented outdoors and the unit was 220v, hardwired. I doesn't bake anything. It cooks it. I hate the way microwaves cook food. Stoves, grills, slow cookers, pressure cookers all produce a superior product. Besides reheating things and cooking potatoes (even then I finish them in an oven or toaster oven) I will cook eggs once in very long while in a microwave so Ill look at your recipe. My recipe is really more of a method to show how eggs may be micro-cooked. We bought a little device some time ago which holds up to 4 eggs, still within the shells(! ), which soft or hard-boils them by steaming them in the shell. I like a hard-boiled egg as a snack often. I'll try to find a picture of the thing. 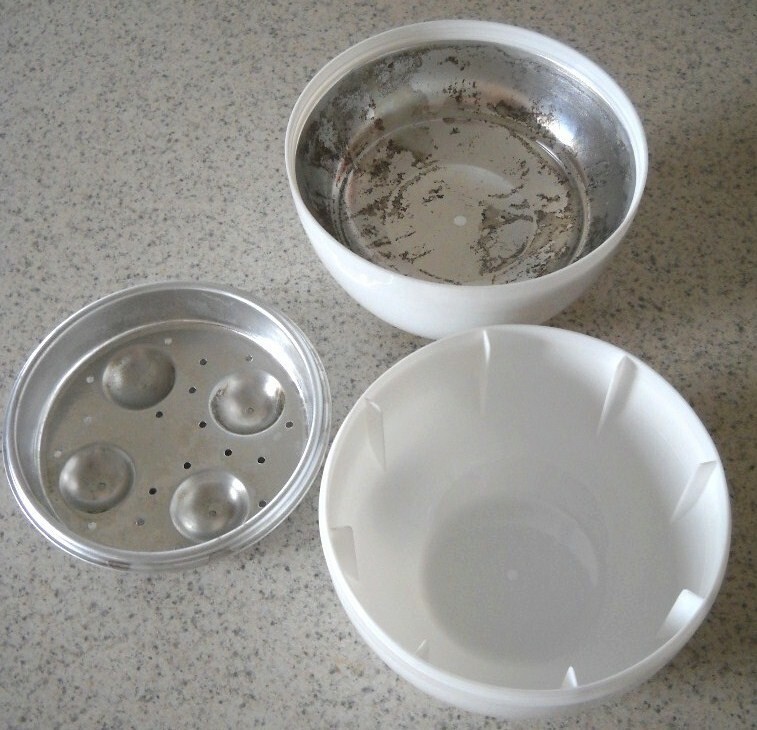 It contains the eggs within a metal insert which prevents the microwaves from actually contacting the eggs, otherwise, they would burst! The two white plastic parts fit together while containing 1 through 4 whole eggs in the depressions within the two metal halves. A flat on the bottom stands it upright; it is made to look like a big white egg! An inch of water is placed in the bottom half of the "egg". Alas, I have not found an assembled image!